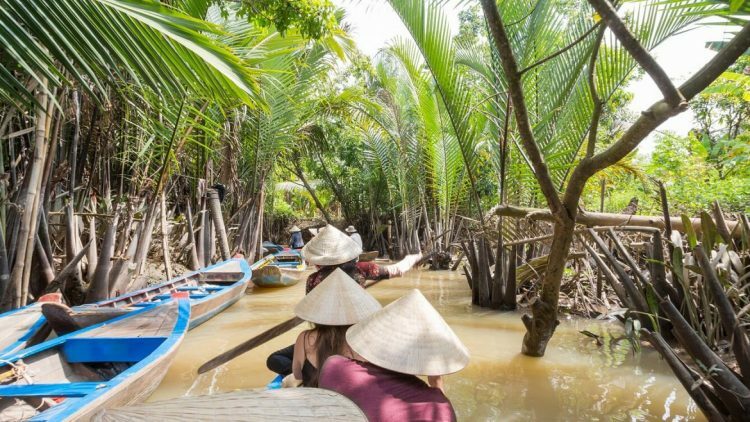 Vietnam – Cambodia, the two neighbouring countries with two different natural and cultural features, has recently become a place for tourists’ discovering and travelling. There have been millions of domestic and international visits to those countries this year. 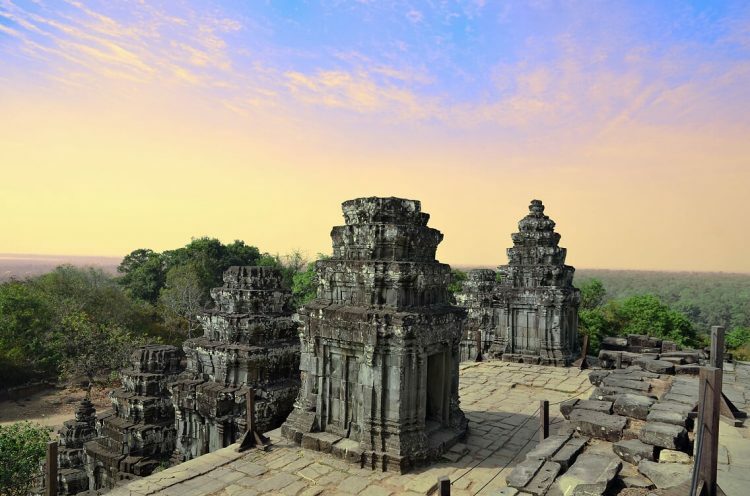 Of all the types of travelling and discovering, Vietnam Cambodia sightseeing tours has proved its position by its ranking in the tourism sector. Sightseeing tour has no longer been unfamiliar with travellers. Nowadays, people have designed a variety of sightseeing and discovering tours, in order to meet the tourists’ demand. There we have a tour to go through Vietnam and Cambodia, such as sightseeing city tour by cyclo, Seaplane tour, Luxury Cruise tour, Trekking and Hiking tour and Waterway exploring tour. Let’s follow to discover those frequent and famous types of sightseeing activities! a. What is special about Ha Long cruise tour? a. When is the best time to try the waterway tour? Cyclo appears as a witness for Vietnam and Cambodia in the 1960s. Especially, booking a cyclo tour to explore the bustling of old streets, the peace within every alley will be a worthy experience for you. Hanoi 36 old quarters is the home of multiple traditional and ancient streets of Vietnam. Here, not only the architecture but also the distinguished features are preserved. Some tourists would say they prefer to walk and enjoy everything in the old quarters of Hanoi. However, this attraction seems to be too large for them to walk and discover simultaneously. Of course, if you want to make an exploration into every corner, stop here and there, it is impossible for a cyclo tour. But the cyclo driver will be the best tour guide that you need, as they have them on a little leash. You are highly recommended to kick off your trip by the late afternoon or the early morning since you’ll witness the harmony of the vibrant and peaceful atmosphere at the same place. 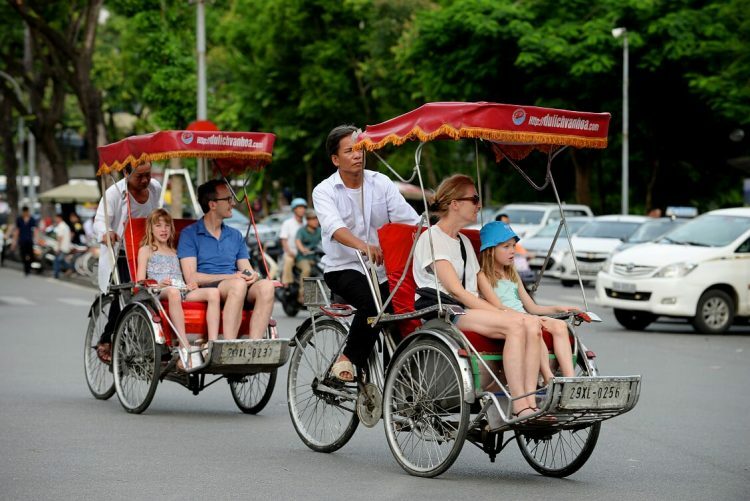 The drivers will pedal you to the historic remnants of Hanoi. The streets are named after different types of commodity such as comb, silver, bamboo, etc. He also takes you to the surrounding famous destinations like Ho Chi Minh Mausoleum, Hanoi Citadel, and The Opera House. 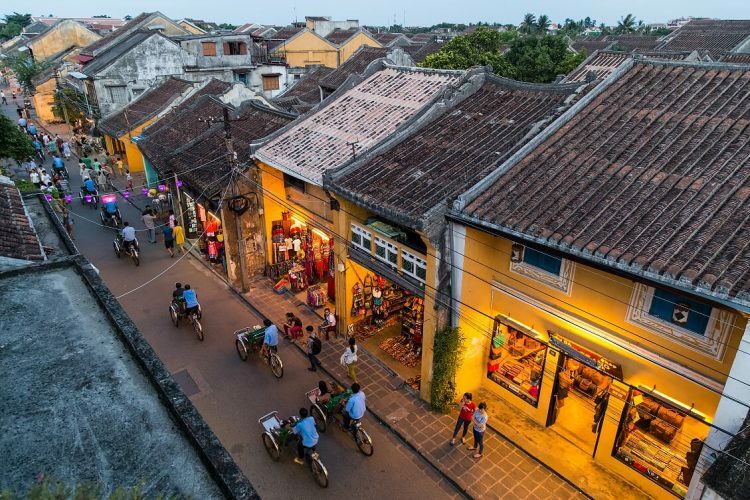 Hoi An has been recognized as one of the world heritage sites since 1999. It is located in the center of Quang Nam province, right next to the bustling Da Nang. The town comprises of 1,107 timber-made buildings with the reflection of indigenous and foreign cultures. Throughout time, Hoi An still remains its outstanding ancient beauty in a remarkable way. A cyclo tour around Hoi An to admire the pristine beauty of this ancient town will be the ideal decision for you. Let’s tell the cyclo driver to take you along Hoi An river bank. At this point, you can enjoy its simple but poetic scenery. They will keep you passing through the fields of corns, potatoes, rice paddy and local fruit-garden one by one. If you love the peace of Riverside, you can get on a boat for a two-hour-discovery tour along Thu Bon river, then down to Cua Dai estuary, and witness the glorious sunset right on the river. Hoi An and Hanoi would be the perfect destinations if you choose to discover by cyclo! If you need more assistance in terms of places and activity plans during this sightseeing tour, please contact the local experts for specific instruction. Have you ever expected to discover the gorgeous beauty of Ha Long Bay within the height of 150 meters from above? If yes, Seaplane sightseeing tour would be the best luxurious choice for a completely enjoyable sightseeing tour within Vietnam. Ha Long Bay is a complex of the natural landscape, including more than 1,900 big and small islands, limestones mountains and green forests. Just imagine you were in a seaplane, under the plane comes the majestic Ha Long Bay. You are taking a view like a bird’s eyes to glance every single corner of this UNESCO-listed landscape. The trip would let you deep into the poetic but glorious fairness of nature. You could also witness one of the most impressive scenery: the water is clear enough for you to look deeply into the bottom, the mountains are imposing enough for you to get surprised. All in one, create a flawless picture, pleasing the eyes of every visitor. Should you intend to visit Halong Bay by seaplane, Hai Au Aviation will appear as one of the most famous seaplane agencies whenever you conduct a research on the internet. This enterprise has been joining the tourism sector for more than 14 years. This is also the only airline offering direct seaplane tour from Hanoi to Halong Bay. We guess you must feel fantastic about the first real balloon flight tour in Cambodia! Siem Reap is originally famous for its natural and architectural beauty for recent decades. However, finding an extraordinary way to explore the attractiveness of this place is seemed to be a ridiculous adventure. Whether you believe or not, a sightseeing tour where travellers are sitting inside a hot air balloon and overthrowing their eyesights to every corner of Siem Reap, has not been a dream anymore. Float up in the sky in the late afternoon, pass through the majestic Angkor, the peaceful Tonle Sap Lake and the crowded floating villages and rice paddies a non-stop line of palm trees, take a range of incredible photo shoot, and indulge your eyes deep into the breathtaking scenery right in front of you: The sun is on the way to settle down, leaving the dark red colour for every single creature and things in Siem Reap. This is the second that you will never forget in your lifetime. Make sure that you make an arrangement for the hot air balloon sightseeing flight in advance to some of the trustworthy agencies like eOAsia or Viator. Or else, if you want to book an all-inclusive tour package to make your discovery diverse and exciting, please leave us your contact. There are multiple reasons why you should choose Ha Long cruise tour as a way to kick off your sightseeing tour. Firstly, you would be able to enjoy the perfect view from the short vision, as the speed of the cruise is slow enough for you to feast your eyes. Secondly, the cruise tour offers you a large place for sightseeing activities, dining and relaxing. Thirdly, the duration will be much more flexible for those who desire to spend a longer time here than seaplane tour. The itinerary will be flexible due to the weather, the visitor’s demand and the length of the journey. You can spend one, two, even three days crossing the whole complex of Ha Long Bay. It consists of Cat Ba island, Virgin Cave, Sung Sot Cave, Hon Trong Mai, Bai Chay, Cua Van fishing village, Quan Lan island, etc. 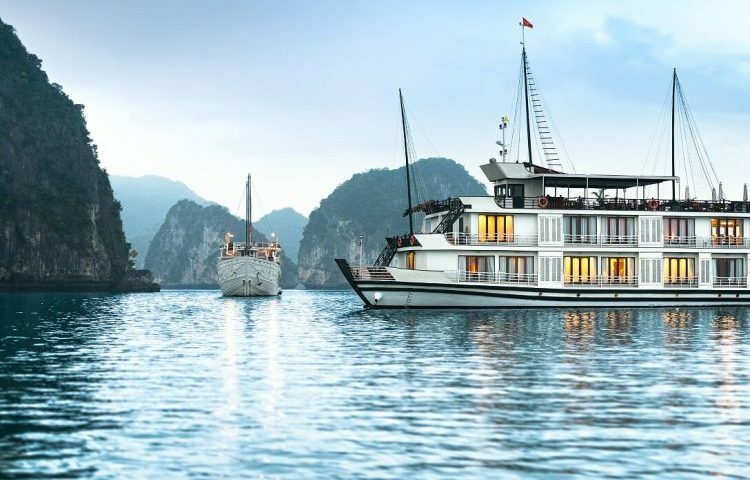 Of all Halong Bay cruise company, Emperor Cruise is the first recommendation, as it can provide tourists with the best service, which exceeds their expectations. 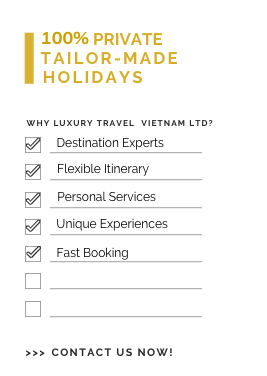 Emperor Cruise offers you the unique all-inclusive Vietnamese cruise tour package. You will have to do nothing except for booking a tour to enjoy the comfort and relaxing atmosphere during your journey. Besides, you can take some of the other cruises such as Paradise Luxury Cruise, Bhaya Cruise, or Ha Long Lavender Cruise. Trekking and Hiking tour has become the common discovering activities for those who are the fans of adventure. Natural landscapes have so far attracted their legs, their souls and even their desire to travel. Let’s check out some of the worth-trying places for hiking and trekking! Sapa is an extremely ideal destination of the adventurers because of its breathtaking scenery. It is the highland region belonging to Lao Cai province. “In the clouds” is the phrase that can describe the beauty of Sapa in an outstanding way, because it gives the feeling of fresh, comfortable and relaxing. The Sapa Trekking journey starts by approaching Cat Cat village, the home of some of the ethnic minorities such as Thai, H-mong, and Hoa. Don’t forget to try the traditional costumes of those peoples, as it would perfectly match with the atmosphere and give you the best photoshoot ever. Then, if possible, you can decide to hire a motorbike to reach Thac Bac Waterfall and Love waterfall. The most impressive thing that you must never forget to do is to reach Fansipan – the so-called “rooftop of Indochina”. Conquering Fansipan used to be the dream of many explorers. Nowadays, the exploration becomes much easier as tourists can choose to go either by cable car or by their own scheduled path. Standing at the highest point of the three countries, you’re absolutely happy with what you’ve done. Let’s throw your eyes down to the surrounding areas, far to the other provinces, and admiring the clouds sluggishly floating through the slopes. Sapa is here waiting for your exploration! 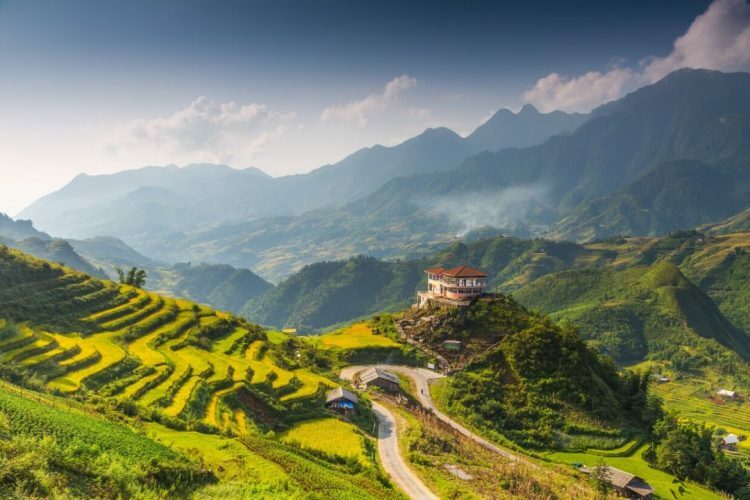 If Sapa is known as the rooftop of Indochina, Puluong is the place that can bring you the vibe of countryside lifestyle in Vietnam in particular and in Indochina in general. Puluong is located up to the northeast of Thanh Hoa province. It stands for outstanding beauty, the mixture of culture and diverse biodiversity spreading from Mai Chau to Cuc Phuong National Park. Trekking Puluong would be a meaningful memory during your discovery journey if you intend to go within summer. This is the right perfect time to admire the shining moment of rice terraced fields. They show out the amazing picturesque combination: the green colour of the growing period together with the yellow colour of harvesting crops. Moreover, Pu Luong Nature Reserve also offers the stunning panorama of a village, challenging the explorers from easy to moderate trekking. You can visit the bat cave at Kho Muong, raft on Ma river, camp on Pu Luong mountain and pleasant life in Thai villages. 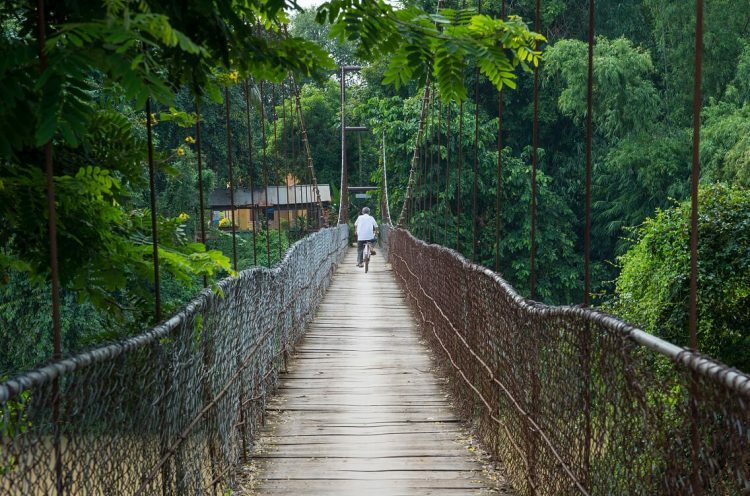 It is better to discover Pu Luong by a bicycle journey. After going through the beautiful Mai Chau, the tour guide will reveal the most adventurous but interesting route for their tourists. 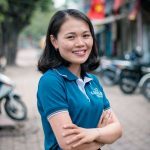 Together with Sapa, Pu Luong is also an ideal destination! Ways to Angkor Wat has never been so hazardous with elephant trekking tour! It is really essential that you decide how to explore Angkor Wat, whether in the normal way that everyone usually does or in an abnormal way but you will remember during the rest of your life. Discovering Angkor Wat on the back of an elephant will make you feel the feeling of wideness, a bit scary and challenging yourself. You should arrange in advance if you choose to book a Cambodia sightseeing tour package, as there are some travel agencies which do not include this adventurous experience in their package. Together with cars, buses, and tuk-tuk, elephant trekking has joint a part of their journey. 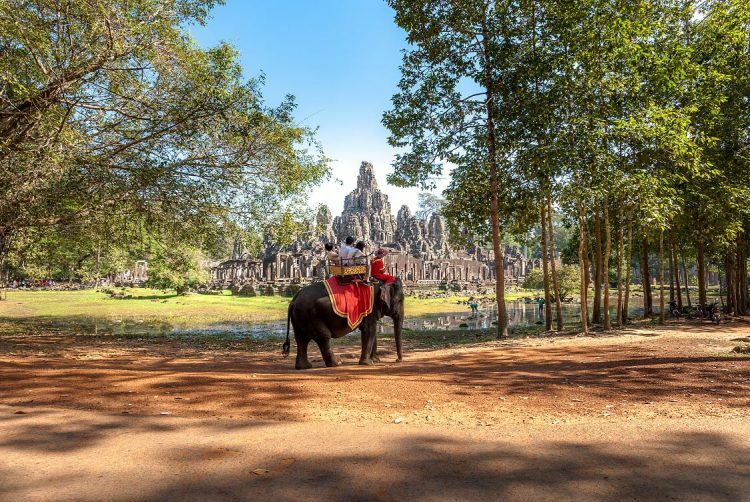 Starting from Bayon Temple, the riders will take you to The Terrace of Elephants, where you can stop and take a brief second of contemplation. Then there comes Angkor Thom – the long-lasting ancient capital of Cambodia. This is another break time to enjoy sightseeing around this architectural construction. Should you approach the highest places of Angkor Wat in the late afternoon, you will definitely catch the breaking moment when the sun is gradually laying down to take a rest after a hard-working day. This is the perfect ending point of one-day discovery tour. Apart from elephant trekking tour, you can also allow yourself to visit other surrounding places such as Tonle Sap Lake, Kompong Phluk floating village. If you are interested in this kind of exploration, do not hesitate to let us be your consultant! Vietnam Cambodia sightseeing tours can be experienced by the waterway route. Fortunately, the two countries have the linkage with each other by the long Mekong river. It spreads from China, going through Myanmar, Thailand, Laos, Vietnam, Cambodia and flows out to the South China Sea. This landform not only creates the trade opportunities, but also bring great benefits in terms of tourism for those member countries. This kind of exploration has put into practice for such a long time, as waterway discovery is seen as the favourite activity of a majority of tourists. In fact, it doesn’t really matter what period of time you choose to start your travelling schedule. There are two junks of time in a year, when the water level is rising higher, and when it comes into the low water season. The tour package will extend your options almost any time of the year, even in the extremely dry season. However, there will be a stormy season that you must consider. It takes place from the middle of August to the end of September. You can make a reservation in advance for a waterway tour, lasting from eight to ten days and initially departing from Ho Chi Minh City. From this station, you are taken through the Mekong Delta to the town of Vinh Long (belonging to Can Tho province). Then, you will be instructed to get on a cruise and start your sightseeing itinerary. You will be given a certain amount of time to explore the bustling atmosphere of floating local market and orchard gardens as well. As the ‘children’ of water-based life, the residents here are always the ambassadors to engage the tourist into their daily activities. It will take you from four to five hours to get around this crowded place. The next destination is Chau Doc. It lies in the territory of An Giang province. It is interesting that if you head up to Sam Mountain to admire the great sunset scenery, you can also take a bird-eye view over the rice fields, which belongs to Cambodia, as Chau Doc is situated right next to Cambodian border. Turning the steering wheel into another country, you’ll immediately catch Phnom Penh – the capital of Cambodia. There, just enjoy a luxurious breakfast and prepare well before continuing the sightseeing tour. Up arrival at Phnom Penh, you will be taken to some of the famous tourist attractions such as the lavish Royal Palace, the huge National Museum, where there are a lot of remains of Khmer sculptures and Angkorian artifacts, Wat Phnom, the Choeung Ek Memorial, and the Russian Market. Try to record every moment of the sightseeing itinerary so that when you come back, you will memorize what happened with you during your sightseeing trip. Temples and ruins – these are the unique features that only remain in the next stop – Angkor Wat. 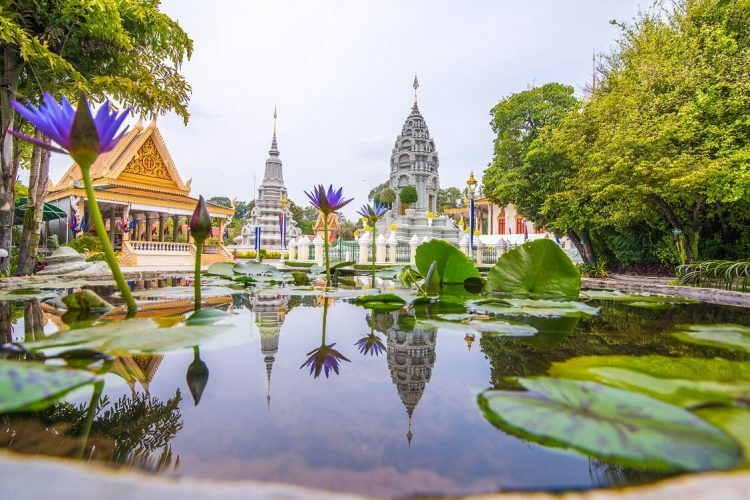 You will be able to learn a lot about the Khmer’s culture and history, as all of the architecture is originated from all of the spiritual heart of the Cambodian. Preservation and restoration plans are keeping the pristine beauty of this archaeological site. Therefore, running an exploration from temple to temple would help you to both satisfy your eyes and broaden your knowledge. Don’t forget to go with your companion, a tour guide. Lastly, let’s visit the watery heart of rural Cambodia – Tonle Sap Lake. 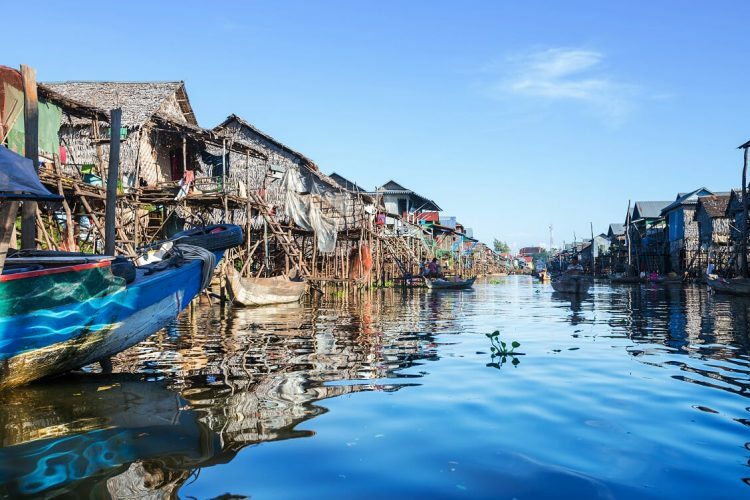 This so-called ‘tiny inland sea’ is filled up with a bunch of traditional floating villages, many of which are influenced by the ethnic Vietnamese culture. On the way sailing the boat to visit the surrounding floating houses, you will see that somewhere appears a small boy jumping on board with a box of candy and cans of soda in his hand and selling with a reasonable price. He and also other residents are the representative of difficult life but still reserve their optimism. Let your sightseeing journey explores the rest of the specialities in this peaceful place. Before the transnational sightseeing tour, there are a lot of things that you have to make plans. So why not design your own tour right now? 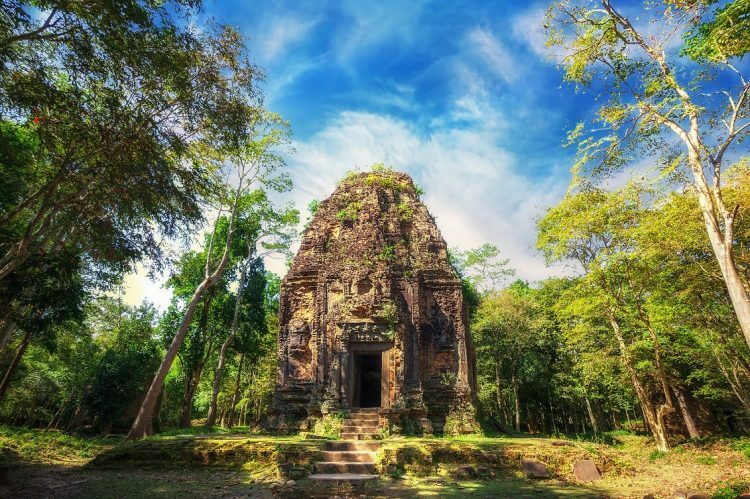 If Vietnam is famous for the complex of bustling atmosphere and majestic nature, Cambodia attracts the tourists by its religious and distinguish beauty, emerging from the ancient architecture and design. As suggested by Luxury Travel, it is a completely perfect itinerary for you and your companions to plan yourself a trip to discover the two nations. Here are the recommended plans that I, together with my family have experienced before. 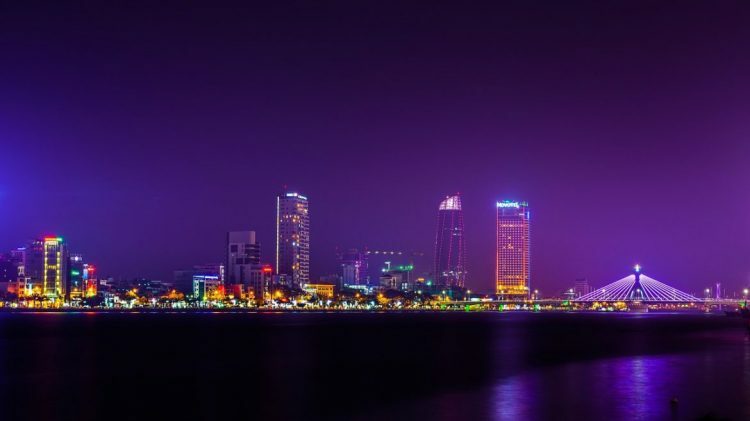 Da Nang is originally well-known as one of the worthiest city to live once in a lifetime. Choosing Da Nang as the place to kick off our family journey has never been our regrettable decision. We visited this tourist attraction on a random day in June, which is the perfect time for relaxation and enjoyment. After checking-in procedure at Sheraton Grand Danang Resort for a two-day-one-night room package, we started our discovery. First, following the tour guide’s step, we visited Linh Ung Pagoda. This is considered one of the largest religious achievements of Vietnam in terms of the area and architecture. We had taken some of the recommendations of what to do here for reference. It was over our expectation. As soon as crossing the threshold of Linh Ung pagoda, it made us feel as if we were entering a fairytale with the immortals only. There came marvelous and breathtaking statues of 18 Arhats, each of whom represents discrepant emotions of human beings. We ended the first afternoon by admiring the fantastic sunset view site on the beach nearby. On the second day, we chose the Marble Mountains as our next destination. This attraction really caught visitors’ attention as it is so-called the “Landscape of Southern Sky”. Not only did us have a chance to catch every single moment of this beautiful scenery, but we could also understand more deeply about the meaning of five surrounding mountains here, which names after five elements of the galaxy: Metal – Wood – Water – Fire – Earth. After arranging flight tickets to leave Da Nang, we continue our holidays by paying a visit to Phu Quoc. This so-called pearl island is situated in Kien Giang province, inherently representing for one of the most gorgeous islands Vietnam. 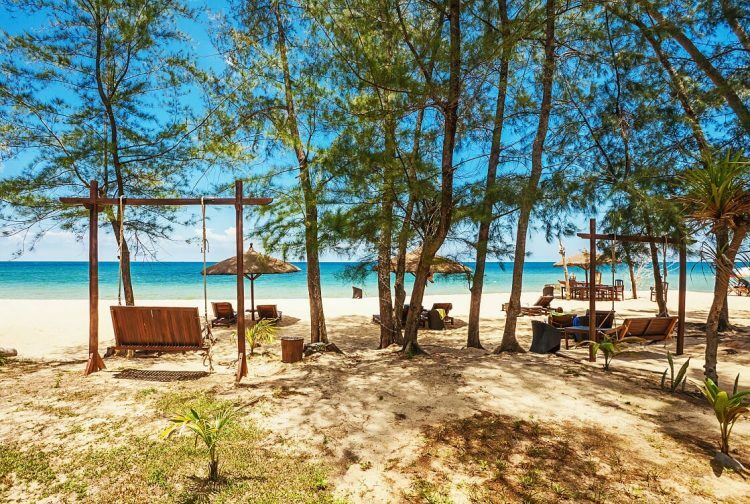 Coming to Phu Quoc, you can make a plan of where to go, what to eat and where to stay. Firstly, we booked a luxury room package at the Marriott hotel. The reason simply is it’s near all of the famous destinations that we desired to go. We book a one-day taxi with a reasonable price, then show our itinerary for the taxi driver. We explored the vibrant everyday scenery of this pristine island in Ham Ninh fishing village. We admired the natural but shining beauty of the ocean from the view of Ho Quoc pagoda. We enjoyed the sunset at Sunset Sanato, one of the places owning the best sea view within Phu Quoc. We spent our whole evening to discover the bustling atmosphere of Duong Dong night market. Here, a variety of seafood and Vietnam traditional cuisine are sold. Don’t hesitate to try those pieces of food specialities as it will make you remember Phu Quoc in your mind forever. Here comes Battambang – the city located right on the Sanker river, so it is usually nicknamed as “The river-based cities”. 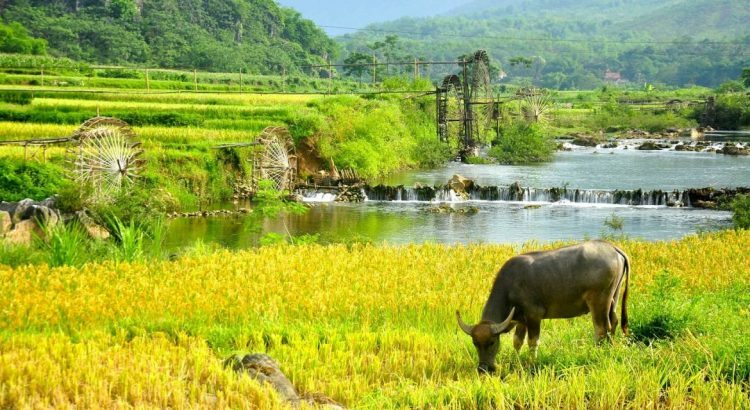 If you have never experienced the rural life, this chance will be perfect to be put into your Vietnam Cambodia sightseeing tour. My family and I rented the bikes and set off to explore this place. Phnom Sampeau Killing Caves was our first intention to go and we actually did it. There were numerous ancient temples and Buddhist architecture in this place that we should never miss to discover. I thought this was the perfect stop-point for all of my family to refill the energy for the next exploration. There is no beach, no bustling atmosphere, no majestic landscape. But there are peaceful sceneries, beautiful lifestyle and worth-trying customs still remaining in Battambang. I guess no one can deny the fame of Siem Reap. This popular stop is the harmony of historical stories and the wonderful natural landscape. We really got a good taste of the real Siem Reap after spending the rest two days here. First came the Angkor Wat. We woke up and got to Angkor Wat in the early morning. 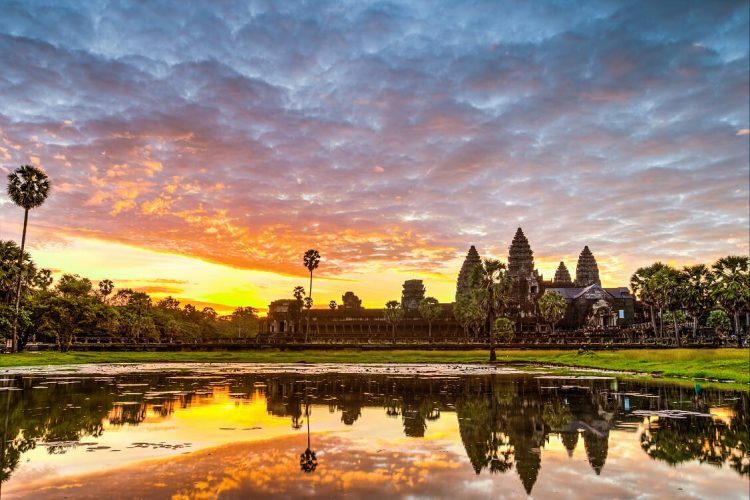 Many people have praised the magical fairness of the sunrise scenery up to the top point of Angkor Wat. It’s magic. It’s absolutely magic. Never in my life did I witness such a fabulous moment like this. The sun is rising, gradually shining every corner of Angkor Wat, creating the glorious colour for this landscape. Try and you will see what I’m telling is upon your expectations! If you intend to try some Vietnam tour activities as well as visiting several Cambodia sightseeing attractions, don’t hesitate to place your own package. So far, we have already gone through many kinds of sightseeing activities together. We hope that from our recommendation and suggestion, you and your companions can absorb a quick look at how what and where to have an over-expected discovery tour will each other. Vietnam Cambodia sightseeing tours are absolutely what you should not miss whenever you decide to put your luggage on your back. So, who will you decide to set your expectation on? Let us be a part of your holiday! 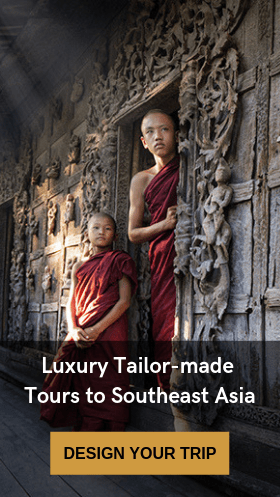 Luxury Travel LTD is an agency which focuses on the high demand of customers. We offer the best enjoyable, luxurious and pleasant tour package to every traveller. If you want to enjoy your holiday without taking your time thinking about where to go, where to stay, what to do, what to eat, just contact us right away and you will definitely have got an incredible experience within your holiday time.